Everyone visiting Athens wants to climb the Acropolis. That amazing citadel at the heart of the city with the remains of spectacular temples, the most well known of which is the Parthenon. Tickets for the Acropolis can be booked in advance, online as a single entry or a combination ticket that included other ancient sites. Skip-the-line tickets and a variety of guided walking tours are also available. 1. Ticket Prices for the Acropolis Only 2. Multi-site or Combination Ticket 3. Acropolis Museum 4. Who Qualifies for Free/Reduced Entry? 5. Buying Tickets for the Acropolis Online, in Advance 6. Are there Long Queues for the Acropolis? 7. Avoid the Queues with a Guided Tour 8. Avoid the Queues with Skip-the-Line Tickets 9. Are Athens City Passes Worth it? 10. Where are the ticket Offices for the Acropolis? 11. Acropolis Opening Hours 12. What Sites Are Included in the Special Package Ticket? 4. Who Qualifies for Free/Reduced Entry? 6. Are there Long Queues for the Acropolis? 9. Are Athens City Passes Worth it? 10. Where are the ticket Offices for the Acropolis? 12. What Sites Are Included in the Special Package Ticket? 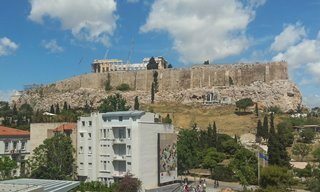 The rocky outcrop in the centre of Athens, home to some of the most well known ancient temples in the World. From 1 April to 31 October, Summer Tickets Cost €20 per adult. From 1 November to 31 March, the price is discounted by 50%, Winter Ticket Cost €10 per adult. Children under 18 (with proof of ID), students and others (scroll down for the full list) pay €10 for their tickets in summer (discounted to €5 during winter). Entry to the Acropolis not only gives you access to the ancient citadel (where you can see the Parthenon and the Erechtheion) but also the North and South slopes, where you can look into the Odeon of Herodes Atticus and explore the Theatre of Dionysus - amongst other features. If you are also going to be visiting some of the other main archaeology sites in Athens, then I recommend getting yourself a Combined or Special Package Ticket. This is an 'official' ticket - in that it is produced and sold by the Greek Ministry of Culture, the body that manages these sites. For this reason the ticket is only available for purchase at the entrance to each of the participating sites, or on the Ministry of Culture and Sports's website (link below). If you buy the combo ticket at the Acropolis, this is what you get (ticket is pictured to the right of the photograph). The other sites then stamp the back of the ticket - as you are only allowed in each of the participating sites (listed at the bottom of the ticket and on this page) once over 5 consecutive days. If you buy your ticket at one of the other sites, you still get the old ticket, a central image with stubs that are removed at each site you visit. For €30 ticket-holders get entry to the Acropolis (the Parthenon and the Erechtheion) with its North and South Slopes, as well as some of the other main archaeological sites in Athens (such as Hadrian's Library, the Ancient Agora, the Roman Agora, Archaeological Site of Lykeion, see full details below). There are museums in the Ancient Agora and the Kerameikos cemetery, and these are included in the entrance ticket for these sites. If you want to visit one or more of the associated sites, and are not visiting the Acropolis, there are individual entry tickets for these sites (prices and other details for each are below). If you do not intend to visit the Acropolis, but do want to visit all other sites - you would save 8€ by buying a multi-ticket. To make entry to the archaeological sites cheaper for local residents, the Greek government recently passed a law by which entry to all sites and museums run by the Ministry of Culture would be reduced by 50% during winter (i.e. 1 November to 31 March). This does not apply to the combined or multi-ticket, which remains €30 throughout the year. Consequently, during winter it is cheaper to buy your tickets individually at the ticket office to each site than purchase a multi-ticket. 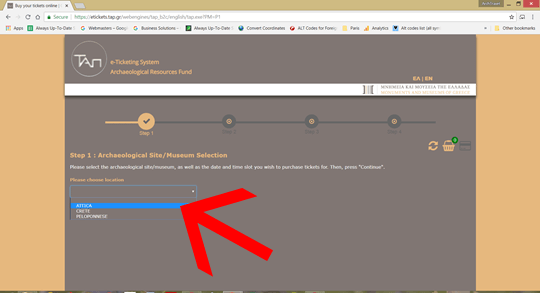 If you are booking online (a step-by-step account is given below) and are eligible for a reduced or free ticket, make this choice while booking your ticket. A voucher will be sent via e-mail. Take this voucher to the ticket office of the site you are visiting, and with proof of eligibility you will be given your ticket. During designated Open Days all visitors have free access to all archaeological sites, monuments and museums in Greece. These days are: 6 March (Melina Mercouri Remembrance Day), 18 April (International Monuments Day), 18 May (International Museums Day), the last weekend of September (European Heritage Days), 28 October (Oxi Day), the first Sunday of each month from November 1st to March 31st. No way to book online - just show up. Top Tip: Having read reports and seen photographs of the Acropolis on 'Free Entry for all' days, I would not waste my time. Or go very early or late. There are always a lot of people taking advantage of the free entry. 5. Can I Buy a ticket for the Acropolis online, in advance? Yes, as of 2018 it is possible to buy tickets online for the Acropolis, both single entry tickets and combination tickets. Buying your tickets online does not give you any special privileges - you join the queue along with everyone else to enter the site. Visit the official e-ticketing service of the Hellenic Ministry of Culture and Sports. Currently it is only possible to buy tickets through to the end of October. For ticket purchases for your trip in winter (1 November 2019 to 31 March 2020), you will have to try again from 1 November when the ticket pricing changes. 7 April 2019 - In the last week I have had two emails from people saying they made an error in buying their tickets (both entered the wrong dates). And these are not the first. They wrote to the department selling the tickets. And the response was an emphatic - 'tough luck, read the Terms & Conditions'. They will not refund tickets bought in error. So that means if your plans change, you can not change your tickets either. So 1) be careful entering the dates/number of tickets you want, and 2) be sure you have the final date. For these reasons, I strongly recommend buying a ticket from a vendor (see the links in the 'Skip-the-line' section below). You *can* cancel your purchase up to 24 hours in advance, and get a full refund. How can these vendors get a refund and you can't? Quite simply, they are buying in bulk. In my opinion, based on the feedback I get, a few Euros is worth it. 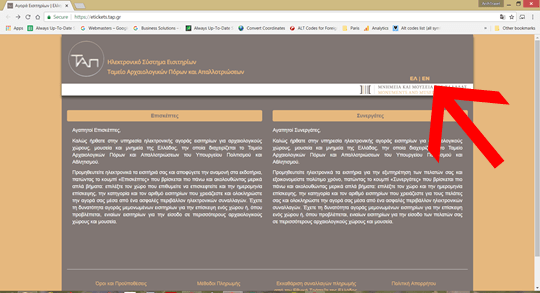 If you are sure, however, and you are careful - the following is a step-by-step guide to assist you through the process, taking you from the Greek language landing page to the final page in the process. Step One: click on the EN to change the website to English. Step Three: click on the white arrow in the location box, and then click on ATTICA. 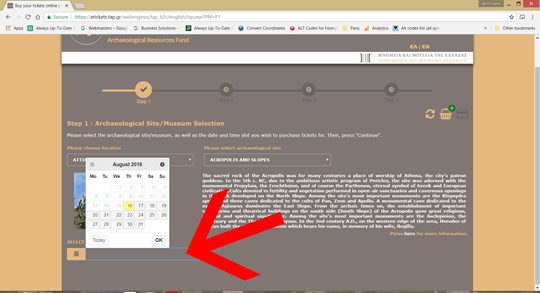 Step Five: a SELECT THE DATE box will appear bottom left, click the box to open the calendar. Choose your date. Step Seven: this is where you choose the type of ticket you want, and how many. Take note of the restrictions below the box. 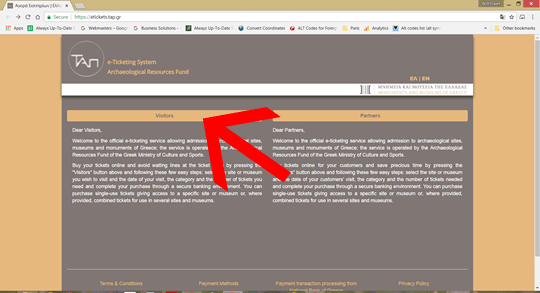 Step Two: Click on the Visitors banner. 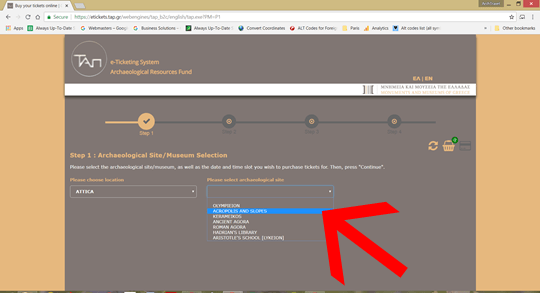 Step Four: a box to the right will open that allows you to choose the site you want to visit. Click ACROPOLIS AND SLOPES. Step Six: the option to choose a time will appear below the calendar. You need to choose the correct date, but not the correct time. Then click continue. 6. Are There Long Queues at the Acropolis? At some of the smaller sites that are included in the Combination Ticket, the queues might not be that long. At the Acropolis, however, the queues can be long - and not only just during the summer months. You can either avoid these queues by taking a guided tour or buy a skip-the-line ticket. Queue at the Acropolis ticket office, around 9.35 am on 27 April 2018. Queue at the main entrance to the Acropolis, around 9.30 am on 27 April 2018. For €39 you can buy a ticket for the Acropolis and a Welcome talk online. This ticket includes entry to the Acropolis, allows you to skip any queues, and a 30 minute introductory talk by a local guide. After the talk skip any queues and enjoy one of the most amazing archaeological sites in Europe! This is a very popular tour and is often sold out well in advance. If you want more than a 30 minute talk, it is possible to choose from a number of tours (they vary in length, and what sites are included on the tour). Taking these does allow you to skip the lines, but entry fees are not included (the reason being some people might already have a multi-site pass, or be eligible for discounts). For example, a two hour afternoon guided tour of the Acropolis costs €32. 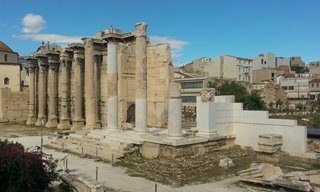 By far one of the most popular tickets, and I think the best value and so the tour I recommend for throughout the year is the five hour tour of Athens, the Acropolis and the new Acropolis Museum. 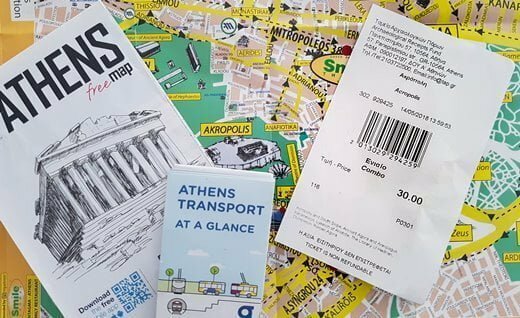 For only €68 you get a guided tour (available in English, Spanish and Italian) with an actual person not an audio-guide, of Athens (visiting the Panathinaikos Stadium, the Royal gardens and the former Royal Palace), the Acropolis and the Acropolis Museum. Entries to both the Acropolis and the museum are included in the price of the tour (€68)! And, this certified walking tour can be booked online here. With a choice of over 60 ticket and guided tour options, see our recommendations the Best Acropolis Tours and Skip-the-Line Tickets. Buying genuine Skip-the-Line Tickets for the Acropolis is possible, and can be done quite easily and safely online. For an additional cost of €4.50 you can buy a skip-the-line ticket (so €24.50 as opposed to €20). This is only available for a single entry ticket to the Acropolis and its North and South Slopes. Besides being able to avoid standing in a queue, you can also cancel this booking up to 24 hours in advance. So, if you find you have made a mistake with your dates (this happens - I get emails about it) or your plans change, you can get a full refund as long as you cancel at least 24 hours in advance. There is *no* refund for such errors or changes of plans if you buy your tickets on the official website. You need to decide whether the time saved and peace of mind is worth €4.50 - only you can make that decision. There is no guided tour included. No audio tour. Nothing. Just a straight-forward skip-the-line ticket. Once you purchase your ticket on the GetYourGuide website, a voucher will be emailed to you. Take this voucher to Key Tours, the local supplier - located at 26 Athanasiou Diakou street next to the Royal Olympic Hotel - about three minutes walk from the Acropolis Metro Station. Here you will be given your ticket - you will not be required to pay any further booking fee. Then head to the Acropolis - not even 400 metres away - and bypass the queues. The email, and link below, also includes details of the opening hours of the supplier and the Acropolis. There are a couple of city passes available. Full disclosure: I have not tried and tested any of these. But just doing the maths, none of them add up for me. First, most attractions are already quite cheap. Second, and more importantly, you would be hard pushed to do everything, or enough, in the time allotted before you start making a savings. Because of the 50% reduction in ticket prices during winter, I would not even consider these passes from 1 November to 31 March. There is the Athens Museum Unlimited Pass, which gives you three days access to 15 different museums and galleries, including the Acropolis and the new Acropolis Museum. Others include the Museum of Cycladic Art and the Museum of Islamic Art. For only €55- I think that is a bargain! Follow this link for More Details and to Book Online. If you have not purchased a ticket in advance, online and you are happy to take your chances, you will need to buy a ticket at the site ticket kiosks. The main ticket office for the Acropolis is below the main entrance to the Acropolis itself. During winter months queues at the Acropolis are not big, you will probably wait at most 20 to 30 minutes at busier times and on the weekends. During summer, it is another story - so follow these tips if you want to avoid the 2-hour plus queues. This is also where you can purchase the special package ticket. But bear in mind that the special ticket is also on sale at the entrances to each of the participating archaeology sites. 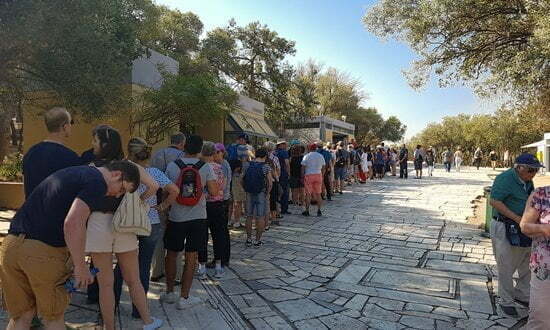 So in summer, if you want to avoid the queues at the Acropolis ticket office, go to one of the other sites listed below (there are never long queues at these sites). Buy the special ticket there, you will pay the same price, ie. €30. You will then be able to enter that site and visit the Acropolis when it suits you, without having to wait in any queues. Once purchased, the multi-site ticket is valid for five days. There is also a ticket kiosk at the entrance near the Theatre of Dionysus. The queues here tend not to be as long as those at the main entrance. During summer months (starting 1 April) the archaeological sites are open daily from 8:00 am until 19:00 pm. During the winter months between 8:00 am and 17:00 pm. The Greek capital has so much more to offer visitors than spectacular ancient ruins. As a start, there are over 70 museums and art galleries, catering to all ages and interests. But, besides ancient history and culture, Athens has a lot to offer visitors who know what they are looking for. The sacred rock in the city of modern day Athens is one of the most well known archaeological sites in the World, and the most visited attraction in Athens. For ancient Athenians, it was the most important religious centre. Although occupied since the Neolithic, it was not until the 11th century BC that the Acropolis became the home of the cult of Athena. The monuments we visit today are much more recent, dating to the 5th century when Athens was at the height of its power. There are a number of religious buildings on top of the Acropolis, the most iconic of which is the Parthenon. The other well known structure is the Erechtheion. While most visitors to the Acropolis head straight for the top, there is much to see on the Northern and Southern Slopes of the Acropolis. The buildings on the slopes of the Acropolis reflect the religious and cultural importance this area had in Athens during the Archaic and Classical periods. Besides the relatively well preserved Odeon of Herodes Atticus and the Theatre of Dionysus, both slopes have a number of sanctuaries, churches and sacred caves. There are two separate entrances, the two slopes are joined by the Ancient Peripatos Street, so both the north and south slope count as a single site. 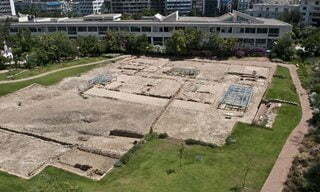 For Athenians, the Agora was not just a market place where they came daily to buy food and goods, it was also the political and judicial centre of the city. There are remains of many ancient temples, but it is the exceptionally well-preserved Temple of Hephaistos that catches everyone's eye. The reason it is has survived so well is because it became a church in the 7th century AD. There are great views over the Agora to the Acropolis from the temple. The Entry to the Agora includes entry to the Museum of the Ancient Agora - housed in the restored Stoa of Attalos, which has a vast and impressive collection of artefacts. Built in 132 Ad, Hadrian's Library was a gift from the Roman Emperor Hadrian, hence its name, to the people of Athens. Hadrian was an ardent cultural Hellenophile, and he did much to leave his mark here. Today we enter the site from the west at the imposing Pentelic marble façade, with its monumental Corinthian propylon, or gateway. 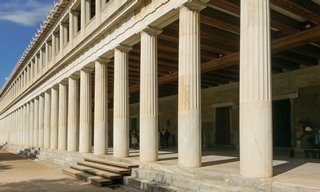 The library was a rectangular peristyle structure with an interior courtyard, 122 by 82 metres. The 'library' where the papyrus books were stored is on the eastern side. A small onsite exhibition room houses a colossal statue of Nike and some other artefacts recovered. 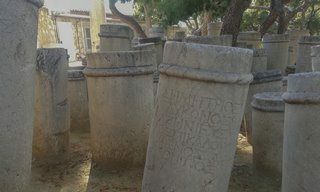 Not far from the Ancient Agora is the 1st century BC Roman Agora. An inscription on site lists Augustus and Julius Caesar as donors for its construction, don't miss this on your way in. The agora was a large courtyard surrounded by stoas, shops and other commercial buildings. Just beyond the agora, but within the boundary of the site as it is today are the remains of the public toilets and the octagonal Tower of the Winds, built for astronomical purposes housing a hydraulic clock. The tower has some exquisite carvings that depict the 'eight winds'. 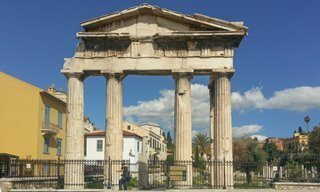 On the northwestern fringes of the ancient city of Athens is Kerameikos. As the name suggests this was an area that was once inhabited by potters. But it is also the site of the oldest and largest Attic cemetery. Walls surround an enormous archaeological site that has a wide range of ancient funerary monuments and structures, from a tumulus mound to family tombs and individual columns. On site, and included in the entry fee is the Archaeological Museum of Kerameikos. The museum houses the artefacts recovered from archaeological excavations, and are displayed to show the changing funerary practices in ancient Athens. The main attraction of the Olympieon is the colossal Temple of Olympian Zeus - one of the largest temples in the ancient world. Despite its size, you can not gaze at this monument through the fence, you have to stand at the foot of these massive columns (16 of the 104 are still standing) to appreciate just how big they are. Beyond the area of the enormous temple are the the remains of other urban structures, including a Roman bath house, various residences, a 5th century basilica, and remnants of the city's fortification wall. Just outside the site, next to one of the busiest streets in Athens is Hadrian's Arch. During recent rescue excavations the remains of an ancient palaestra were discovered. This was the legendary Gymnasium of Lykeion (Lyceum). Historical sources suggest this area was an idyllic grove, it is best known to us as the location of Aristotle's school of philosophy. The name comes from the sanctuary of Apollo Lykeios, which was built sometime before the gymnasium. But sadly this temple was not found during the archaeological investigation of this site. For visitors today a surface area of 0.25 hectares (50 x 48 m.) has been exposed, revealing part of the palaestra where athletes trained in wrestling and boxing. Unless you have mobility issues, if you are relatively fit, all of the sites are within walking distance of each other. The Olympieon is the only site on the south side of the Acropolis away from the Acropolis. 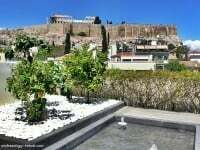 But, it is not that far from the Acropolis Museum - which is just opposite the entrance to the South Slopes of the Acropolis and the Theatre of Dionysios. All the other sites are to the north of the Acropolis. And all but the cemetery site of Kerameikos are close to each other. Kerameikos is not that far to walk from the Thesseio Metro Station. Being in the centre of Athens, there are many restaurants and cafés, as well as street vendors selling refreshments, close to the sites - and not all seem to be taking advantage of tourists. Pressed for time? If you are relatively fit I suppose you could visit all sites in one day, but it would be a long day and a bit of a rush. But it would be a great day! While getting yourself to all of the above archaeological sites is easy and straightforward, sometimes, just sometimes a guided tour is a great idea. 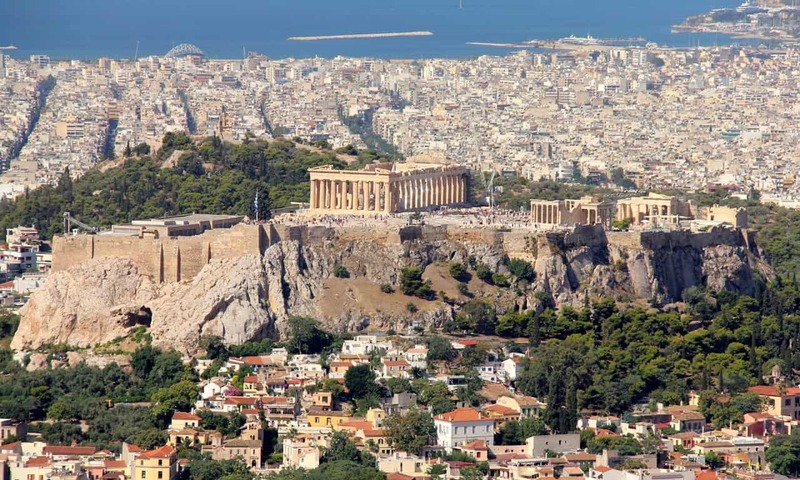 And of course there is so much more to see and do in Athens than this list of amazing sites. There is the obvious option of a half-day sightseeing tour of the highlights of Athens, morning or afternoon - you choose. For something really different see the Acropolis of Athens by Segway on a 2-hour tour, led by a local guide! Or experience the beauty of Athens by night with dinner and folklore show. Escape the city for a peaceful break and a luxury, day cruise with lunch. If gastronomy is your thing, treat yourself to a Greek Food and Wine Tasting, or go one step further with a Greek Cooking Class in an Athens Taverna. 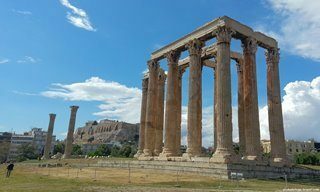 These are just a few of the many activities available to visitors, just have a look at this more complete list of things to do in Athens, which includes some great ideas for day-trips out of the city. During my stay in Athens, I was a guest of the 4* Herodion Hotel. 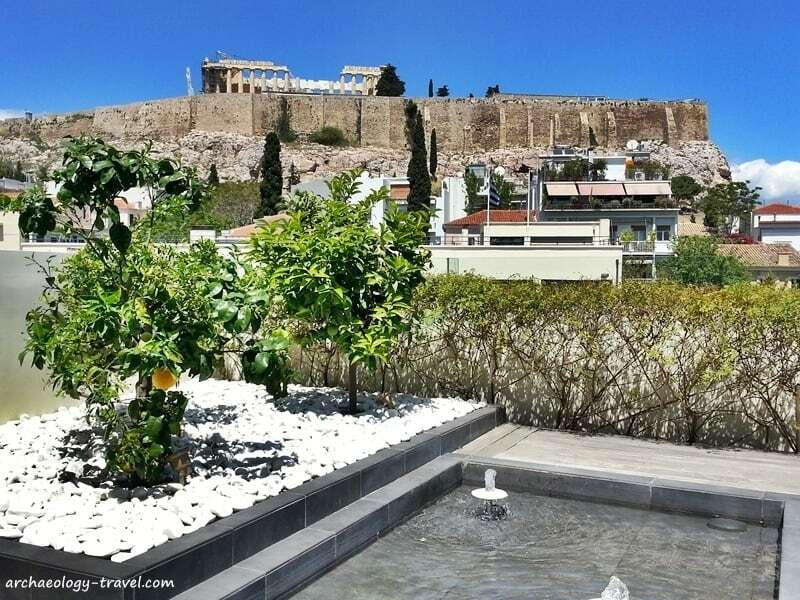 The view on to the Acropolis from the roof top terrace (on which meals are served) and bedrooms on the northern side of the hotel is any archaeology traveller's dream! After a day walking the streets of this ancient city, getting into bed and dozing off with a light up Parthenon in sight is quite magical. The hotel is literally a stone's throw from the Acropolis Museum, so take advantage of the late night openings. The Herodion is also ideally situated for easy, walking access to all the best sites and museums in central Athens, and the metro for those that are further away. Their in-house map of the city centre is one of the best I saw. Thank you for taking the time to write such a detailed blog, I really enjoyed reading this. I’m going to Athens for the first time in a few months and I’m quite excited about it. I was wondering if there are other sites in Athens or other parts of Greece that also give out nice ticket stubs with a picture image of the site (like you showed the Parthenon ticket which had a picture of it). Other than that one, is there other ticket stubs in Greece I would get? If so, which sites/museums? And are there plenty of places to buy replicas of the Parthenon and items like that? I am glad you enjoyed reading the post – I hope it helps with planning your visit. I love Athens, so if it is great archaeology, good food and wonderful hospitality you are after you will have a good time. Most of the tickets to archaeology museums and sites have photographs on them – its not just this one. Believe me, you will see lots of places to buy replicas of all kinds, some better than others. If you have a few days, don’t buy something from the first place you see – take your time and see what is on offer from the various shops and kiosks around the city. 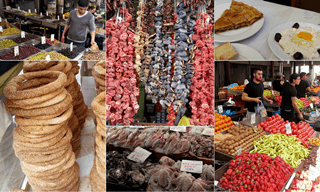 All things being equal, I will be posting my Guide to Athens at the end of next week – with many more tips on what to do in the city, including suggestions and information for day and short trips from Athens. Getting to the islands is very easy and highly recommended. Enjoy Athens, and come back and tell us how you enjoyed it! thank you for your reply. That’s a great tip about not rushing to buy replicas as I will probably see a lot. I’ve been to Paris and Rome before, and I have a feeling I will see many replicas of the Parthenon and other structures just like I would see of the Coliseum and Eiffel Tower. But I agree about the archeology, I can’t wait to see all that Greece has to offer. I live close to NYC, so between living close to there and my trips to Chicago, Philly, DC, and many other parts of America and the world, I’ve been into archeology for a long time. And the older I get (I’m in my mid 30’s now) and the more I travel, the more I marvel at what is out there and all I still need to see. I look forward to reading your posts you mentioned you would do at the end of this upcoming week. I was going to look into it more, but I wanted to try to do day trips to Olympia and Delphia, and possibly one or 2 more in addition to enjoying all that Athens has to offer. Where is your next adventure to? thanks again for your time. Where does one buy the Acropolis pass from? Hi Thomas – another question that I forgot to include in my earlier one. How long is this pass valid for? Some sites say 4 days, some say 7. Thank you again. Apologies – I seem to have omitted to mention where you buy the tickets! Thanks for the question. You buy the tickets at the ticket kiosks that are at the entrances to the sites. When I was in Athens in May, the ticket lasted four days – I have not seen any information that says that is different now. Hi, planning to visit Athens this April with 3 children and granny. Are there long queues to buy tickets and enter? Last year we queued for 3 hours at the Alhambra in Granada only to be told right at the end that all entries for that day had been sold!! Hi Ana, you will not find long queues in April. I suppose in the peak tourist season there are longer queues, but I doubt they are three hours long. They will be longest at the Acropolis itself, but my tip is to purchase your tickets at any of the other sites – they all sell the same ticket. Buy the ticket at the entrance to say Hadrian’s Library, will then mean you do not stand in line for tickets at the Acropolis, but go straight on up to the Acropolis and show your ticket at the entrance. Thank you for all these informations. I was wondering, is there any discount for people who are studying art history or archaeology? Yes, there are discounts for higher education students, so make sure you have your student card with you – proving that you are currently a registered student. If you are a student in the EU, you get free admission. If you are a student from outside the EU the ticket is only €6. About the student discounts, I have one doubt: I’m mexican but I’m currently studying a MSc in UK, I have my student ID from the University. Do I have the discount? Yes, you do get the student reduction of 50%, you just need to make sure you have your Student ID on you – it does not matter whether you are a UK national or not. Since Marija’s question I do not think EU university students get free entry – I will check on this for you. I will go in two week to Athens and I have some doubts regarding the ticket for the Acropolis. You says that the 12€ ticket is valid for 4 days but is it also valid for visiting the same monument more than one time? As far as I know the ticket only allows for one entry to the Acropolis. At the smaller sites, you could use your ticket stubs for the same site as they are not named tickets and can only be used for the smaller sites. But the ticket for the Acropolis is identified as being for the Acropolis and for the Acropolis only. A great time to be visiting Athens! Hi, Loved the way you described Greece! Beautiful ! I’m going to Greece on a cruise, I already got my tour package on the ship but I need to get the 12 euro ticket to go into Acropolis, I have tried so many sites but couldn’t get thru, Do you know a site that I could buy just the ticket not a tour ? As I say in the post, the ticket can not be bought online only at the entrance to the sites. Just go to the Acropolis and get your ticket at the ticket office there. just a word of thanks for a really useful site. I went to Athens in June and found visiting a lot easier having read the information here beforehand. I spent a pleasant day on a Friday walking around all the sites. Very easy to do and nicer at your own pace. PS Also delighted to read you had a great time in Athens! 1. Can I purchase the multi-site ticket online ahead of time? If not, where do you recommend we purchase? We were mostly interested in the sites, not so much museums. And does the one price of Acropolis really include other sites like Olympeion Zeus and Hadrians Arch? 2. What are the top 5 sites you recommend for someone who is visiting for the first time? 3. Any dinner location recommendations? 4. We are also visiting Santorini and Mykonos. Any recommendations for those locations? Glad to know you find the information useful. 1. 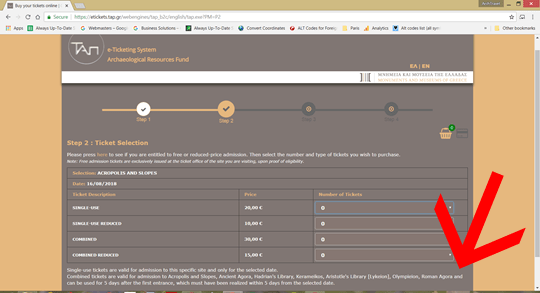 The answers to your first set of questions are outlined in more detail above, but briefly, no you can not buy a ticket online. It really is as simple as that. You can only buy a ticket at the Acropolis ticket office, or at the entrance to the other participating sites (all those sites listed above). The ticket is €12 (unless you qualify for the various reductions), that gives you entrance to the Acropolis and 6 of the other sites (all listed above). If you only choose to go to the Acropolis, you still pay €12. Hadrian’s Arch is right next to a busy street and it is not fenced off in anyway, and so you can walk right up to it without having to pay to see it. The Olympeion Zeus is fenced off in a large area, and entry to that is part of the Acropolis multi-ticket scheme. 2. Ooooh this is a tough one. I would start on the southern side of the Acropolis, more specifically at the Olympeion, it opens at 8.00 am (buy your tickets there and then you are good for the day). Then walk to the nearby Acropolis Museum (it has variable opening hours, 10pm on a Friday), and then to the sites on the south slope of the Acropolis (Odeon of Herodes Atticus and the Theatre of Dionysus), and then on to the Acropolis itself. Spend as much time as you like there and then visit the other group of sites on the northern side of the Acropolis. I would not miss Kerameikos and the Ancient Agora. 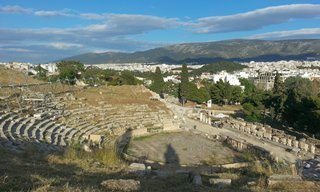 Alternatively, after the Museum and the Odeon and the Theatre, you could go to Kerameikos, come back to the Ancient Agora (Hadrian’s Libary and the Roman Forum if there is time) and then end the day on the Acropolis (it closes at 7pm). I think that is the best you can do in a day. 3. I do not normally do food recommendations, but there are some great restaurants along the northern edge of the Ancient Agora, on Adrianou Street (Hadrian Street), have a look at the map above. There are also some good restaurants between the Olympeion and the Acropolis Museum. 4. When you are on Mykonos, you just must visit Delos. It is a small, but archaeologically very important island nearby. There is a booth in the harbour on Mykonos where you buy the ticket – which costs about €18, and depending on the weather the boat-ride takes anything between 20 and 30 minutes. There is also a €5 entry fee for the island. On Santorini, you must visit Akrotiri – a Mycenean village that was covered in volcanic ash, that is being excavated. The preservation is excellent, and the site is often likened to Pompeii. There are some beautiful, well preserved frescoes. Thanks for the very useful information! Because I am not so fit physically, knowing that the sites may be visited seperately, is very helpful! Thomas, thanks for the great guide! We’re going to be in Athens on our Honeymoon cruise in September and I’m using your guide as we plan our itinerary for the day. In fact, I wanted to give you a shout out on our own blog that we’ve started to keep track of all the adventures that we will see in our travels. You will have an awesome day in Athens. I will definitely keep a look out for your adventures. There are so many wonderful restaurants in the area of Hadrian Street you will not have any difficulty choosing one. Have fun, and congratulations in advance! I own a 12€ ticket from spring visit with 4 unused entries, but seems that since 1. May this ticket is not valid because fee changed to 20€? True or not? Yes, the price increased to 20€ for the Acropolis or 30€ for all the sites in April. But even if you have unused entries at the new price they would be invalid anyway as the multi-ticket is only valid for 5 consecutive days. Hi Thomas, many thanks for such a useful and helpful webpage! I was wondering if you can help share light on the opening hours of these sites on Mondays. I am confused as some websites say they are closed (like the Acropolis Museum), others say opening only at 11am (for Acropolis). Yet other websites claim they are open on Mondays from 8am. Pretty difficult to plan our day if we don’t know the opening hours. Do you know where to get the official opening hours? Thank you in advance. My contact in Athens has confirmed what I thought, and what is on the official websites. The Acropolis Museum and the Acropolis (and other sites) are open on Mondays from 8 am. Last admission to the museum on Monday is at 3:30 pm, while it is 19:30 for the archaeological sites. The conflicting information on different websites may be because the information is out of date (I think the museum was closed on Mondays up until last year), or because the information is from another time of year (there are differing opening hours in summer and winter). I asked for a ‘free entry multiticket’ when I arrive at the Olympieion and showed my >65 card from UK. The guy in the ticket office told me that I could get 1/2 price (€15) but not free. It was still brilliant value at that price. Your tip about not buying at the Acropolis was very useful. When I went there, after the Olympieion, at about 9am there were already about 30 in the queue. When I left after 3 hours there were 200+ (and the heat was fierce). I also got 1/2 price at the Acropolis Museum – €3. Thank you for your blog, it is very helpful so much information. It will be my first time in Greece. Thanks for all this helpful advice. I knew about the multi ticket from a friend who recently visited but I I like having as much detail as possible. Your insights are great and the descriptions of the sites are wonderful, I’m even more excited to go now! Thank you so much for taking the time to put this together. As I understood, it is not possible to purchase tickets online, but only on the sites themselves. My wife and I are over 65 but we are not EU citizens (we are from Israel). Will we get a reduction? Sadly, no it does not apply to you. Besides being 65 and over, you would also have to be either a Greek or EU citizen. 1. It would be worth getting the multipass ticket to visit those places you mentioned, at any of the tickets booths at the site, but you recommend not getting it at the Acropolis because of the queues? 2. The multipass would allow me to skip the queues? 3. The mulitpass does not included guided tours, but I could pay for that separately – however I’d have to stand in a queue? I would also like to ask your advice please? 1. Does the mulitpass include transport, and if not, is there a transport card for the metro/train/tram/bus, or is it better just paying for it each time? 2. Is the hop on – hop off bus worth doing? 3. I was thinking of visiting the Acropolis late in the afternoon for sunset, is that a good idea? Thank you for your kind words Alex. Happy to answer your questions. 1. Yes. Although the queues at the Acropolis are only really bad in the morning. 2. 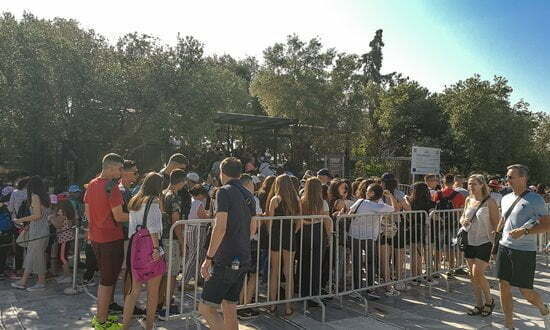 If you buy your ticket at say the Olympieon, you then do not need to stand in queue for a ticket at the Acropolis – you still need to get in a queue to get into the site. At the Acropolis there are two queues, one for the ticket and one to get into the site. The second queue goes quite quickly though. But, do not go to the main entrance for the Acropolis, go to the Theatre of Dionysus entrance – a fraction of the time. 3. Yes, the combo ticket does not include guided tours. Usually, guided tours are able to skip the queues (not always). 2. Hop-on-hop-off buses are fun, and are a good way to get about. And can be a good option – depends on your circumstances. 3. Yes. YES. YES! The mornings are terrible on the Acropolis. Late afternoons are still buys but no where near as busy as the mornings – everyone is exhausted by then. 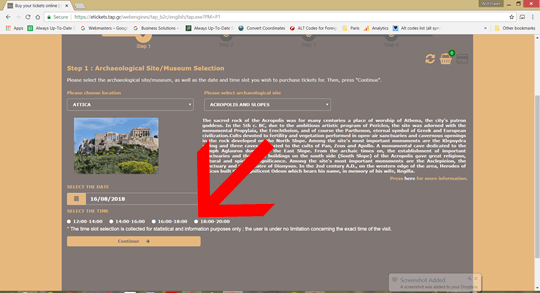 A question about the online tickets for the acropolis: when I buy it online, can I skip the lines? Or do I have to queue anyway? Great to hear from Vienna! If you buy your ticket online you get to skip the queue for purchasing a ticket – but you still need to queue to get in to the site. That is really only a long one in the mornings. And it is worse at the main entrance, easier at the Theatre of Dionysus entrance. Or get a skip-the-line entrance ticket. So are they going to have free tickets? Young people up to the age of 18 get free admission. So yes Sora, I think your two sons go free! I’m an 18 year-old secondary school student from Poland. Do you think I’ll be eligible for free ticket if I show ISIC card at the cash desks? How far in advance can I buy an Acropolis combined ticket online? I was practicing using your instructions, no problem, trying to buy a ticket for April. But the system would not accept April dates. It did accept March dates. Actually the date I want is 12 September 2019 for the acropolis combined ticket. Do you know when September dates will be available for online Acropolis purchase? How far in advance can you buy Acropolis tickets? Thank you for your kind words. And excellent question. The reason you can not buy tickets for April to October now is because during those months the ticket price is different to now (summer price versus winter price). And the web designers have just not managed to work out how you (and many others) can buy tickets now but pay the summer prices. I am not sure when that will get resolved as this website only came into being in September 2018. I can not believe that anyone will only be able to buy tickets for April to October 2019 from 1 April. So I will keep an eye out on this issue and keep you all updated.